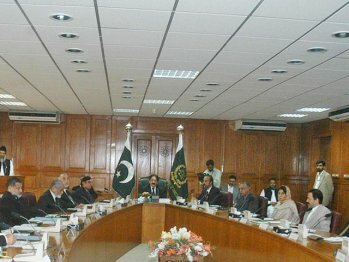 ISLAMABAD: Meeting of the governing body of Access to Justice Development Fund (AJDF) was held in the Conference Room of Supreme Court of Pakistan under the chairmanship of Chief Justice of Pakistan Justice Iftikhar Muhammad Chaudhry. Chief Justices of the High Courts, Federal Secretaries of the Ministry of Finance & Law, Justice Parliamentary Affairs and Secretary Law and Justice Commission of Pakistan were amongst those present. The fund will ensure that requirements of the district judiciary were met and monetary aid is made available to those who cannot afford a counsel, Justice Ifikhar, the chairman of the Governing Body, observed. He said that the body should ensure that the funds are used transparently. He appreciated the role of Law and Justice Commission of Pakistan and asked high courts from all the provinces to recommend projects. Thirteen different projects were approved by the Governing Body and it decided to earmark 10% of the funds for Khyber Pakhtunkhwa (KP) and to distribute the remaining 90% to the rest of the provinces under the National Finance Commission Award (NFC).